Join the discussion on our forums! Come discuss Hench-Clan Shadequill over in our dedicated Hench-Clan Shadequill discussion topic. Very big Zombie Chow or Injured Blademaster without side effects. Can be combined with Divine Spirit and Inner Fire. A pretty good card. Value trade with this and before sacrificing, play Auchenai Phantasm. Arena: Pick on sight. Priest doesn't care about healing the opponent and if it takes the board it tends to just win. So strong in any kind of control Priest. 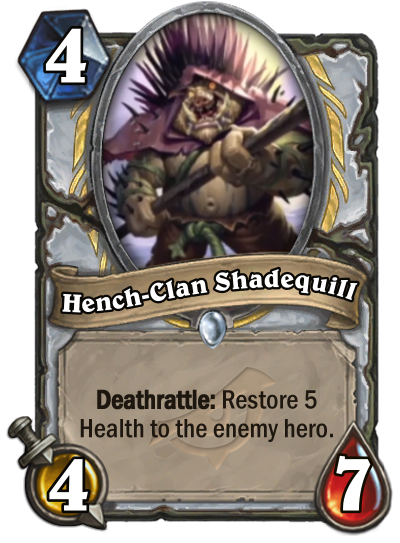 Must have in any Reno deck just because the insane stats (except combo variants).